Delay finalization of Stage 3 until the impact of the Medicare Access and CHIP Reauthorization Act of 2015 (MACRA) is known and the meaningful use provisions of MACRA are developed through regulation. Delay finalization of Stage 3 until there is actionable data from EP participation in Stage 2 of the Program. Eliminate any Stage 3 objective that would require actions on the part of the patient or other third parties in order for the EP to successfully participate in the Program. Replace the full-year proposed reporting period with consecutive 90-day reporting for all years of the Program. While CMS previously indicated it would seek to release a final rule this summer, the negative reception to the proposed rule by MGMA and other industry groups could lead to a delay of the final rule. For more information on the Stage 3 proposed rule, read MGMA’s member-benefit outline. 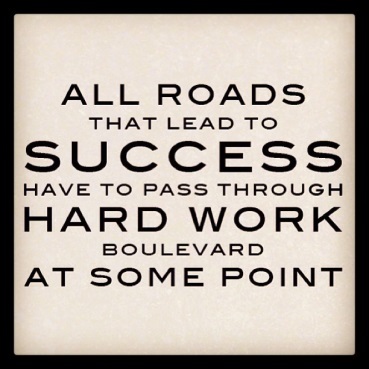 I couldn’t agree more with the quote on the left, and that is where NCMGMA finds itself, on “hard work boulevard.” We are carving out a road that is pointing towards success for our organization and we have, now more than ever, the right people working with the right teams to help create that success for NCMGMA. That is not to forsake those who came before us and who lead us to where we are now; their tremendous achievements afford the current leadership the privilege to render the decisions, with some financial freedom, that many other state MGMAs cannot claim, making NCMGMA extremely fortunate. Just last month, NCMGMA wrapped up another successful Spring Conference, with over 160 attendees and 125 exhibitors, packing the Marriott Grande Dunes with administrators and healthcare professionals. Many thanks to the Conference Committee and Affiliate Development Committee on their hard work to make our Spring Conference one of the best to date with the focus being all on QUALITY. We tried out new formats, including a productive and effective “Tedx type” presentation which resulted in some great feedback from our attendees, along with a specialty-specific roundtable which I found extremely valuable myself. Thank you once again to our fantastic Alliance Sponsors and Spring Conference Exhibitors and Sponsors. NCMGMA could not host our high-level conferences and resources without your support. As President, I highly encourage all members to reach out to those vendors who support NCMGMA on this level when in need of a service for your practice. You can find a list of Alliance Sponsors on the left-hand sidebar of this news resource as well as on our website. Thank you all! During the Thursday evening Dinner and Awards, NCMGMA awarded the 2015 Administrator of the Year Award, presented by Steve Parker of Medical Mutual to Sandra Jarrett. For those of you who know Sandra or have needed assistance within the past year from NC Tracks or Medicaid, you know this was a well-deserved award. 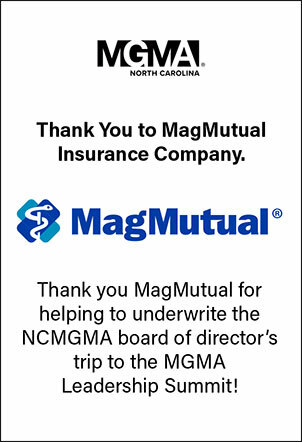 Thank you to Medical Mutual for your support of this prestigious award and your continued support of our members. NCMGMA’s first-ever Leadership Summit, scheduled for September 16-18, 2015 at the Pinehurst Resort. We hope you will make the decision to join us for this very special Summit which, by design, will be focusing on you, our members. Created by our Conference Committee, this Summit will work to fine tune your leadership skills both professionally and personally. We encourage you to consider identifying those in your practice that you may want to begin challenging to build up their leadership abilities. There will be an additional staff rate available again. 2016 will bring lots of change for our membership as we plan to host additional meetings such as our Roadshows, where we will be bringing great state-level education to our members locally, and also a joint conference with our partners at the NC Medical Society in the Fall. Much more to come on these thrilling initiatives, so be on the lookout for more information coming soon. Again, I have always believed that having the right people in the right place at the right time can lead to amazing things and NCMGMA is ON the road to success. We are expecting more with our association as we begin planning for the Fall Leadership Summit and our 2016 initiatives. We are looking forward to providing additional value to your membership as we progress. We have exciting news to share with you! Thanks to the hard work of our dedicated volunteers, we will pilot a national study group webinar series beginning in June. We will host weekly webinar sessions for those interested in board certification and preparing to take the board certification exams. The sessions are open to anyone interested in certification or planning to take the certification exams, and there is NO registration fee. Interested individuals can register for the bundle of 8 sessions, or individual sessions. Those who register will also have access to a dedicated Board Certification Study Group Member Community where they can ask questions, post messages and interact with the content experts/presenters during the series of sessions. To learn more or to register for the sessions, click here. Please feel free to share with your state members, study group participants and anyone interested in certification. These sessions are open to non-members who are interested in certification as well. 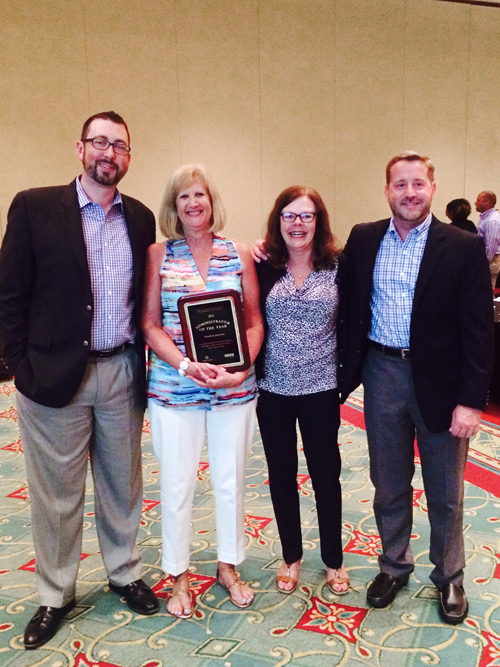 Sandra Jarrett, Practice Manager for Salisbury Orthopaedic Associates, PA, was named the 2015 NCMGMA/Medical Mutual Administrator of the Year at the North Carolina Medical Group Management Association’s 2015 Spring Conference. The event was held May 13-15 at the Myrtle Beach Marriott Resort & Spa at Grande Dunes. The Administrator of the Year award honors a medical practice administrator who has demonstrated exceptional leadership and management proficiency, and who has helped enhance the effectiveness of health care delivery in North Carolina. Sponsored by Medical Mutual Insurance Company, the Administrator of the Year Award also provides the recipient with a stipend for continuing education at a state or national Medical Group Managers Association (MGMA) meeting. Ms. Jarrett has been the practice manager at Salisbury Orthopaedic Associates since 2013. Under her direction the practice continues to earn high monthly Press Ganey survey scores. Recently their goal was to obtain a 95% score on the surveys but actually obtained a 97%, ranking them number one in their division (out of 25+ practices). Sandra Jarrett is a long-time member of the NCMGMA. She is the chair of the Medicaid Committee and a regular participant in the NCMGMA’s Legislative Days and the North Carolina Medical Society’s White Coat Wednesday, where delegates from across the state meet with North Carolina law makers to address their industry needs and concerns. Approximately 250 people were in attendance at the NCMGMA Spring Conference where the theme was “Quality.” This year’s conference featured a sold out exhibit hall and a new format designed to increase interactivity between guests and presenters while offering attendees more hands-on, specialty-specific information. In a significant victory for physician group practices and MGMA, late Tuesday evening the Senate voted (92-8) to approve the Medicare Access and CHIP Reauthorization Act, H.R. 2. This legislation, which passed the House of Representatives on March 26, permanently repeals the Medicare Sustainable Growth Rate (SGR) formula. President Obama publicly stated that he will sign the bill into law. Permanent repeal of the SGR has been a top priority of MGMA’s advocacy efforts. We thank our members for their critical grassroots support in getting this legislation passed.